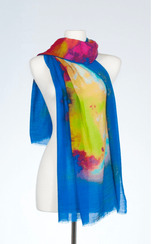 There is nothing like a beautiful scarf to top off an outfit perfectly. We love the bit of gorgeous color to frame the face, the print to create movement and life, and the softness of the signature Banaris fabrics against our necks. We have one at the ready all the time, it's a secret weapon--able to fend off the chill, the outfit "blahs" and it always, ALWAYS lifts our spirits!